10.2 Thor Heyerdahl - Thor Heyerdahl's Final Projects - by J. Bjørnar Storfjell, Ph.D.
by J. Bjørnar Storfjell, Ph.D.
Visit the new Thor Heyerdahl Research Center in London directed by Bjørnar Storfjell. 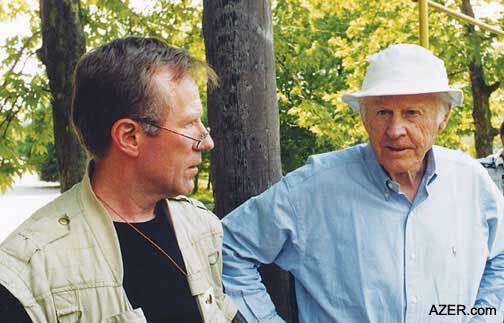 Above: J. Bjornar Storfjell with Thor Heyerdahl in Azov, Summer 2001. Photo courtesy: Storfjell. Since his first visit to the Caucasus early in the 1960s, Thor Heyerdahl had stored in his memory the similarities he found between the petroglyphs in Gobustan near Baku and the petroglyphs in Scandinavia, especially those in Alta, Norway. Even though this similarity belonged to pre-history and could not be transferred to later history at the beginning of the Viking era, Thor nevertheless suspected that there might be other cultural connective links between the Caucasus and Scandinavia. That was the reason for his visit to the region in the Autumn of 2000. He was on the trail of Odin (Wotan), the Germanic and Nordic god of the mythologies of the early sagas. According to Snorre, the Icelandic author of the Nordic Sagas, who wrote in the 13th century, Odin was supposed to have migrated from the region of the Caucasus or the area just east of the Black Sea near the turn of the first century AD. Thor wanted to test the veracity of Snorre and, consequently, organized the Joint Archaeological Excavation in Azov, Russia in 2001. 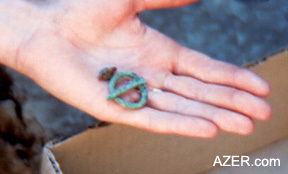 An ancient fibula, a type of garment pin, one of the objects found at Thor Heyerdahl's dig in Azov, Russia. I met Thor in Moscow on April 21, 2001. He had already contacted Dr. Sergey Lukiashko of the Institute of Archaeology at the State University of Rostov-on-Don. Thor had been planning an excavation at this site because of the peculiar phonology of the place - name Azov. Snorre speaks of a place called Ashov (read As-hov) - the sacrificial site of the As tribe. This phonological coincidence led Thor to start his investigations in Azov, Russia. I had met Heyerdahl earlier in Azerbaijan in the summer of 2000 while excavating the Kish church [See Storfjell's article, "The Kish Church - Digging Up History" in AI 8.4, Winter 2000]. Heyerdahl appointed me chief archaeologist for the Scandinavian team, which was composed of two other Norwegian archeologists and two Swedish archeologists. For a period of six weeks, we carried out the excavation with our Russian colleagues. The results of the first season brought to light more than 35,000 individual pieces of material cultural remains, which have now all been numbered and registered. Most of these items would excite only archeologists and offer little occasion for joy to the uninitiated. I am primarily referring to broken ceramic vessels whose many fragments filled several buckets each day. But it is these unglamorous fragments that yield their secrets about the dates of their creation and help us to assign dates to the various layers of soil that are being excavated. 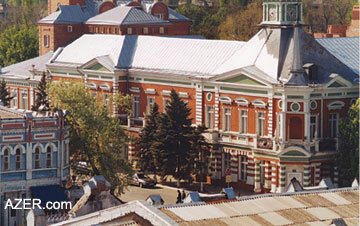 Left: Azov Regional Museum in Russia. 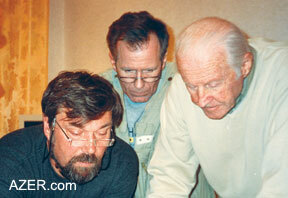 Work begun in Search for Odin - Thor Heyerdahl's project - in Summer 2001. Photo: Bjornar Storjfell. Among the more significant finds were several fibulae - circular ring-pins used to fasten garments - which can be dated to the 1st-2nd centuries AD. They showed a clear affinity with fibulae from the Baltic region and would not have been out of place had they been discovered there. The same can be said about a sword found in a burial from the same period. After just one season of excavation, we can demonstrate a certain level of cultural connectivity between the steppe region of the Black Sea with the Baltic. It is very likely the great rivers of Russia were the conveyors of these cultural links, something that puts us right back into an environment that Thor Heyerdahl was very much at home with - water. The first season - Summer 2001 - in this extensive project took place in Azov, Russia. The total scope of the project envisions several more seasons of excavation in and around Azov. Then the investigation will move to the Caucasus, where the As and Van peoples once lived. This is all recorded in the Norse Sagas, but about 2,000 years before Snorre in Iceland wrote about these people groups, the Van were referred as a geographical term in Assyrian contemporary records in the 13th century BC. The As are identified in contemporary Assyrian records from as early as the 7th century BC. This evidence warrants continued research in the Caucasus, not just to test the statements of Snorre, but to help us understand more about a region that has figured so prominently as a cultural bridge, early in human history. 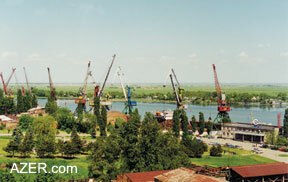 Above: The Port of Azov on the River Don, ancient Tanais. Credit: Bjornar Storjfell. 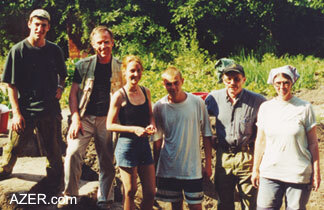 In Search for Odin - Thor Heyerdahl Project - excavation team began work in Summer 2001 and continued in Summer 2002. At age 86, Thor was one of the most energetic persons at Azov. Each day last summer, he would visit every excavation site - five in total - scattered throughout the city. We Scandinavians were excavating in a strawberry garden with the kind permission of the owner, who decided to forego the berries in favor of ancient history. At meal times during our discussions, the ideas began to emerge about how we would carry on Thor's archaeological work. Half a year later, those ideas of a research center became a reality. In the meantime, after the excavation, work shifted to analysis of the finds and the task of writing up the reports of the fieldwork. Thor continued working on the manuscript of what was to become his last book. "Jakten på Odin" (In Search of Odin) was published in Norway a few months later, in November 2001. (The English version is scheduled to appear around November 2002.) A couple of days after Thor returned to his home in Tenerife in the Canary Islands, following the book launch in Oslo, Norway, I visited him in connection with writing up reports on Azov. But it seems he had other matters to discuss. Right: Sergey Lukiashko, Russian Archeologist, Thor Heyerdahl and Bjornar Storfjell, Norwegian archeologist, discussing plans for the Azov dig in Russia 2001. He had been offered funding for the second season of excavation in Azov, and in that connection he wanted to establish a research center. He honored me by asking me to set up the center and then to direct it; it would be located in England for a variety of practical reasons. By the middle of February 2002, the Thor Heyerdahl Research Centre had become a reality. It was organized and registered at Companies House in England, and Thor Heyerdahl was the first Chairman of the Board. Now his widow, Jacqueline Beer Heyerdahl, holds that position and is eager to oversee the continuation of Thor's work in Azov, the greater Caucasus and beyond. Beyond that, there is a new project that Thor was planning in Samoa in the Pacific. He had been made aware of the existence of a pyramidal structure that is thought to be the largest of its kind in the Pacific. In February 2002, he visited the site with Jacqueline and started making arrangements for an excavation to begin in Autumn 2002. He had wanted Samoa to be his last project. It was in the Pacific that he had started his long and illustrious career, and it was there that he wanted to close the last chapter of his professional endeavors. But April 18, 2002 conspired against him. Thor Heyerdahl, perhaps the best-known Norwegian of the second half of the 20th century, died peacefully in his sleep at his family home in Colla Micheri in Italy, where he had gone to spend the Easter holidays with the closest members of his family around him. The Norwegian Government gave him a State Funeral in the Oslo Cathedral on the April 26. His urn will be placed in the garden of the family home in Colla Micheri. Even in death, he belonged to the world. He is dearly missed. At the time that this article was written, Bjornar Storfjell was the Chief Executive and Archaeologist of the Thor Heyerdahl Research Centre.